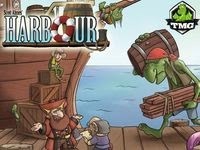 I received a prototype version of Harbour from TMG and these are my thoughts. Harbour is also one of my current Featured Kickstarters. Because everything was in prototype form I don't really have much to say here regarding component quality as these pieces are not the final product. I will say though that the completed artwork is great and the updated pictures and concepts presented on the Kickstarter look good. The icons are understandable and the game layout is easy to grasp. This is meant to be a lighter micro type game, that really is a step up from that. I really enjoy worker placement games and this one is good. You only have one worker however and no means of gaining more. This keeps the game very simple compared to many other worker placement games; for better or worse. This is a very accessible game to younger kids or people new to games. Rules are mostly strait forward, although I had to check the bgg forums to answer some questions - I believe that they have or will fix those issues for the final product. Mechanics are you move to a new building and perform that action. A good variety of buildings with a solid market system is what makes this game. Each player also has a different character card that gives them a starting building and a unique ability. Unique abilities seem to be something that people desire more and more. It helps add variety to game play and helps keep strategies perhaps different from one player to another and provides that replayability factor many require. How well balanced are these abilities? Not sure. They at least don't seem too unreasonable. The market mechanic does a pretty good job simulating market pricing and demand with recently sold items dropping in value. It is a good mechanic. I want to play around with possible variations such as starting all the resources at each cost but whenever something is used, it drops to zero and climbs by one or a player chooses one resource to increase by one (or something like that). I will say that it seems to work better with 2 or 3 because as you add more players the greater the market fluctuates and then the strategy of playing or planning according to the market becomes much harder and it feels more like a luck of the draw what resources are worth more. Resources are kept on a track that only allows you to have a certain number of each resource. This mechanic, reminding me of Roll Through the Ages, works well in this setting and the game really drives you to diversify while also playing to your strength. A lot of the buildings have not only acquire type actions bit trading certain resources for others. In fact, I think the trading of resources throughout the game using these different buildings is the true cornerstone to the game. Many say it is the market, which is good, but I like the different trading options and how that all interacts with the market and maximum storage etc. It all works really well. A fun game that I actually see enjoying more myself with only 2 or 3. Good game and that is How Lou Sees It.